NOTE: This page describes how a regional service agency serving a number of different districts can use the Zones feature. If you are a regular district client, then the previous page, Managing Zones (for Districts), applies to you. There is also a page describing the use of the Zones feature by Ministries of Education, Consultants, Foundations, Associations, Vendors, Grantors, Teacher Preparation Programs, and Others. If you have already set up your zones, then skip to the next topic, Managing Schools. The Zones feature was originally added to TIM Tools for use by large districts to group schools by geographic area, by level, by participation in a special program, or any other factor of their choosing. A regional agency can use the same system to create a zone for each component district (or charter or private school if the agency supports them). The controlling agency manages the TIM Tools instance as a centralized service on behalf of the component districts. The agency can use information from specific districts or schools to make recommendations, reveal needs, and make data-driven decisions about technology purchases and professional development. District comparisons can identify equity issues among districts. School or district reports can be generated and shared with the appropriate leadership at those locations. Every TIM Tools instance begins with a default zone. You may add as many zones as you have individual districts or schools. The default zone and every zone you create is automatically assigned an ID number. You will use these ID numbers if you choose to add your schools via a spreadsheet. 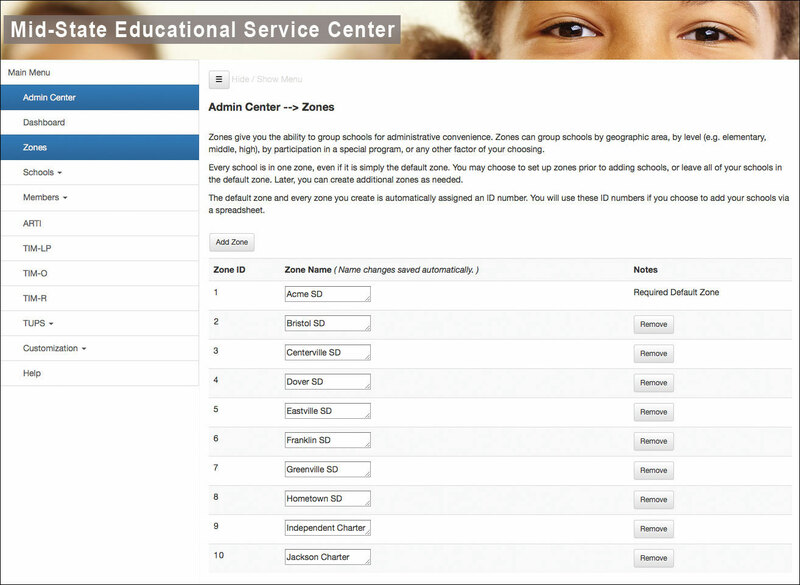 Access the Zones window by selecting Zones in the Admin Center. The screen capture below shows a regional agency that has created zones for 8 districts and 2 charter schools. Figure 1. Establishing a zone for each district or independent school in a cooperative or regional service agency. Every school is in one zone, even if it is simply the default zone. then enter the membership via spreadsheet with their schools identified. Otherwise, you will waste time going back and forth to assign existing members to schools and/or assign existing schools to zones. Add a zone by clicking the Add Zone button and giving the new zone a name. Change the name of a zone by clicking in the text box and typing the new name. Delete a zone by clicking the Remove button. All changes to this page are saved automatically. TIP: If, for example, you want a total of 50 zones, rename the default zone to the name you want for your first zone, and then create and name 49 additional zones for a total of 50. The default zone and every zone you create is automatically assigned an ID number. You will use these ID numbers if you choose to enter your schools via a spreadsheet. Throughout this Guide, you will see many references to “districts” and “zones.” Please keep in mind that when a TIM Tools instance is used by a regional agency as a service to many districts, the regional agency is acting as the “district” and each supported school district is a “zone,” even if that district consists of just a single school. Also of interest to regional agencies is the extreme flexibility of the Set Member Roles feature. Using this panel, you can create roles with permission levels exactly tailored to your situation. For example, you can duplicate the Zone Leader role and name it District Superintendent. That role can be tweaked further to allow for the exact combination of permissions you wish to devolve to your component districts. As always, if you have any questions about how to configure your TIM Tools instance to meet your needs, just send us an email at TIM@fcit.us or give us a call at 813-974-1640 and we’ll get back to you with an emailed answer or a scheduled phone call or video conference. We originally created TIM Tools with a conventional district structure in mind. We are constantly amazed at how well it adapts to use by school associations, consultants, technology vendors, foundation networks, and other entities we didn’t expect as clients. We love solving problems and interacting with our clients. It’s our dedicated customers who have suggested most of the features we offer today.